To be the best on the rink, skaters must spend endless hours strengthening and conditioning their bodies off the ice to build strength for the rigors of their performances. Illustrative and technical, yet user-friendly, Conditioning for Figure Skating provides detailed coverage of the physical preparation necessary for Preliminary through Senior-Elite skaters while concentrating on all disciplines of figure skating, including singles, pairs, and ice dance. More than 300 photos illustrate proper warm-up drills, flexibility stretches, cooldown routines, strength training exercises, jump and plyometric training programs, and endurance conditioning exercises for on-ice injury prevention. A periodization plan also helps skaters maximize their training potential. Figure skating has evolved dramatically in the past few years, with a greater emphasis on triple and quadruple jumps, jump combinations, and dramatic lifts. And to stay competitive, skaters must spend hours developing their strength, power, flexibility, and endurance to perform these maneuvers. 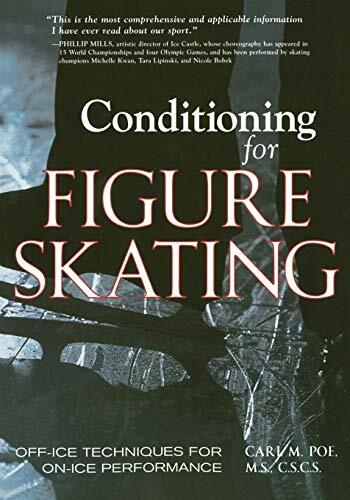 Conditioning for Figure Skating is a technical, user-friendly guide that teaches you how to improve your strength, increase your power, and condition your body off the ice to improve your on-ice performance. Appropriate for skaters at all levels and all disciplines--singles, pairs, and ice dance--this manual explains the physical preparation needed to excel at the sport. Whether you are a skater, coach, trainer, or parent, you can use this book to establish a training structure to maximize your or the skater's potential. Carl M. Poe, M.S., C.S.C.S., has designed strength and conditioning programs and has trained figure skaters for the past seven years.